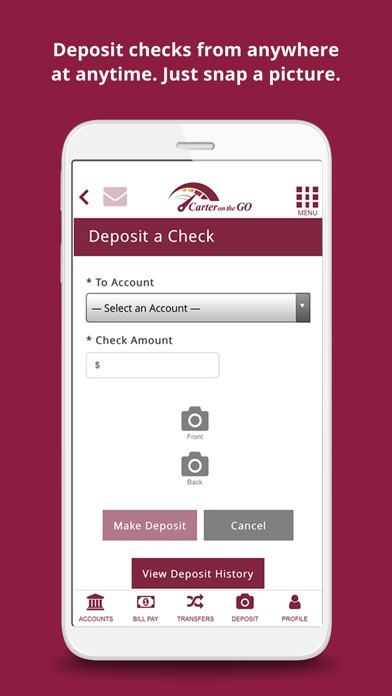 Discover a convenient way to bank with “Carter on the Go” Mobile Banking App Manage Bank Accounts •	Access your accounts with our touch ID capabilities •	Activate Fast Balances to view your accounts prior to log in •	Quickly review account activity, balances, statements and check images •	Easily transfer money between Carter Bank & Trust accounts •	Stay on schedule with customized alerts through email or text notifications •	Save time and gas money with “Carter on the Go” mobile deposit Pay Your Bills •	Schedule or pay bills directly from home, work or while “on the go” Need help? 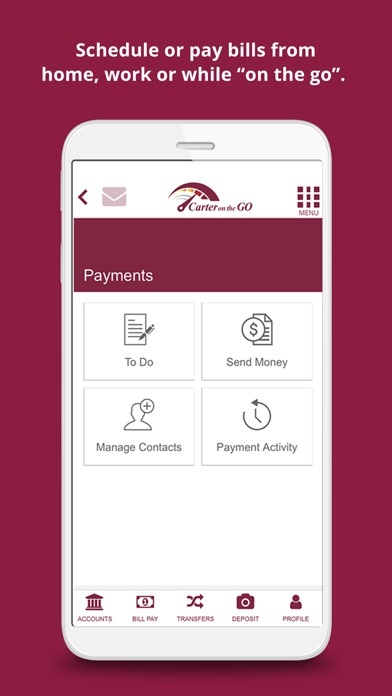 •	Call one of our bank specialists, 833.ASK.CBAT or 833.275.2228 •	Visit one of our branches in Virginia and North Carolina •	Go to CarterBankandTrust.com/CarterOnTheGo for how to videos and answers to frequently asked questions See Disclosure Agreement at CarterBankandTrust.com/CarterOnTheGo for terms and conditions for accessing your bank accounts through “Carter On The Go,” Carter Bank & Trust’s online and mobile banking channel. 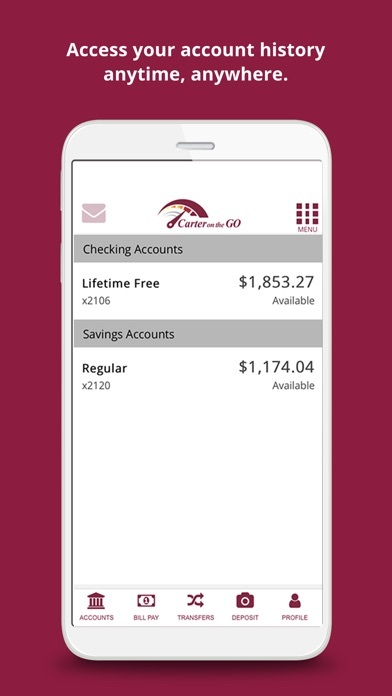 Nothing beats my local branch, but I love having everything at my finger tips! 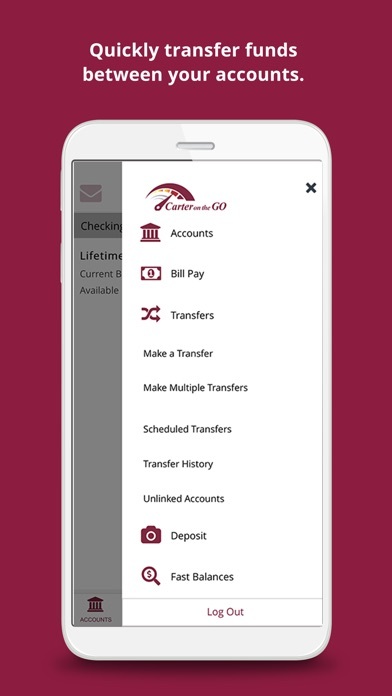 Banking on my fingertips...fast, reliable and secure...a big thumbs up to the Carter Bank!!! 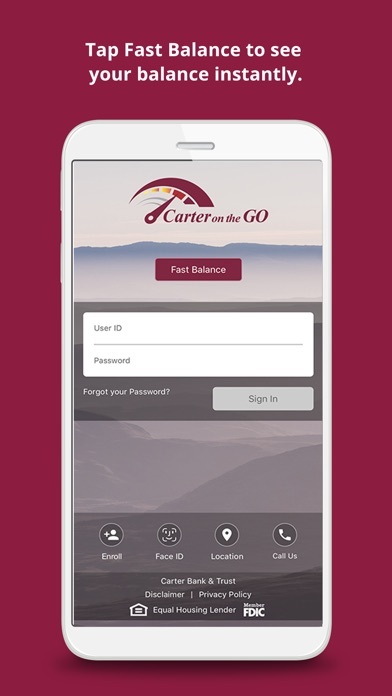 Thanks to Carter Bank & Trust! !